Finding ways to unblock restricted websites is one of my favourite hobbies. In the past I shared few tricks that unblock restricted web sites, Instant Messengers and tricks specific to accessing YouTube and Orkut. As users learn new tricks to unblock the web sites, network administrators are also tightening all the loop holes in the security systems. Few networking administrators are going to extent of blocking all the web URLs which contains the words like YouTube, Facebook, Orkut, etc. If such strict measures are placed to sensor web at your organisation then you might not be even able to read http://blog.techdreams.org/2007/11/access-blocked-youtube-at-office-school.html as the URL contains the word YouTube. If you organisation has such strict web sensor policies and none of the our previous tricks work, here a new set of tricks. Instead of entering the address of your favourite website in the browser location bar, enter IP address address of the site. 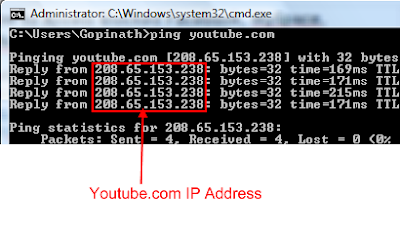 For example access YouTube by entering the IP address http://208.65.153.238/ instead of entering http://youtube.com in the URL bar. To identify IP address of a web site you can use the simple MS Dos command ping or this free online service. Use Opera Mini Browser Online Demo application to access favourite web sites in a small screen window. Opera Mini is a popular web browser for mobile phones. 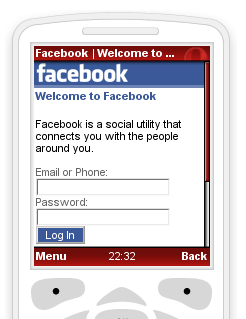 It allows users to work with live demo of Opera Mini that functions exactly like it would when installed on a handset. Point your browser to http://www.operamini.com/demo/ and start accessing blocked websites. Disclaimer: Use these tips and tricks at you own risk. Your organisations may consider accessing blocked web sites and messengers as breach of security policies and guidelines that may result in any inconvenience. Good stuff man. I can actually access facebook at work using the opera mini thing (the IP one didn't work). Would you be of any help in helping me unlocking MSOffice07? (Not just the serial number - that I have - but also the activation). i normally use letmehide.com for accessing all blocked sites.They are really fast and no popup ads..
i use www.punky.co.za to access facebook when it's blocked.. love it!! letmehide.com and www.punky.co.za don't work for me. opera does. thanks to tech dreams! why do non of these techniques work i just wanna see my facebook and everything i do it says http404 not found or someshit i think the administrator here knows all this stuff is anything else i could try im begging plz somebody help me out here. It's not a .COM site and it's never been blocked from my networks. Hope this helps. OH MY GOD. this saved me! @Mark : Proxyheaven .... Miracle worker ........ thnks a tone man !! !